Towards a vision of the future: Regulations of the Poligono Central. 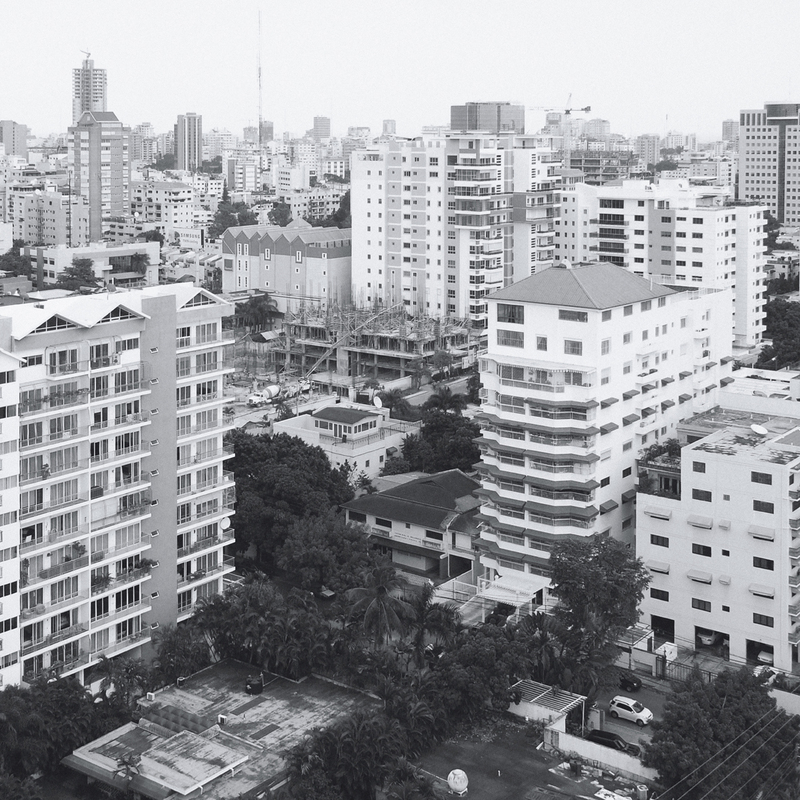 Critique of Urbanism in Santo Domingo. Architecture inside the Poligono Central is governed by laws that determine the maximum size of any building. The current limits of the Poligono Central are: Av. John F. Kennedy (north), Av. 27 de Febrero (south), St. Ortega y Gasset (east), Av. Winston Churchill (west). If we extrapolate the development of the built city based on the current regulations of this area we could identify three big stages or “generations” that mark the development and increase of the city’s density. In the first generation (low density), abounds the single family house with one or two floors. These houses have an adequate separation from the adjacent neighbour to maximise natural ventilation and the feeling of privacy. An ample front yard with abundant vegetation is commonly an intrinsic part of this arquitectural typology . Later, the apartment blocks (3 to 4 levels) and the malls (2 levels) are the next typologies that we can find in the natural development of the city. As the city grew the apartment blocks became higher and the malls bigger. Due to the minimum requirement of lateral boundaries stablished in the regulations, high buildings displace the houses. The voluntary but still forced eviction, produced by the friction between houses and buildings, forces the lots to be sold to new promoters and inversionists to develop higher density buildings, commonly in search for a product that generates the maximum possible return. This strategy to increase income requires the maximum percentage of usage of land, which then produces the maximum possible volume. Parallely, the rest of the land turns into parking space, reducing the permeability of the land to collect rain water, and so reducing the apparent vegetation in the city. The requirements for vehicle parking written in the “ Regulation for vehicle parking in buildings, 1989” demands 0.4 parking spaces per inhabitant. Today architects design apartments considering 1 parking space per inhabitant, more than twice the vehicle density estimated by the regulators. This is symptomatic of underestimated projection of the regulations in use. The design of the current regulations of the Poligono Central increases the city’s density, with consequences to the experience of urban space, or to the quality of life of the inhabitants. The development led by construction promoters accelerates densification. The next step follows: investors acquire and unify lots to create ‘mega-lots’…and consequently create ‘mega-projects’. Today there isn’t a stipulated limit for the total area of a lot. Only the vehicular traffic roads delimit the growth of the mega-lots, and even then, there are cases where it is possible for buildings to overrun the limits and the street. There is an absence of order to better the constructed shape of the city and the life quality of the citizens. The “right to light and natural ventilation” and the “right to privacy” are examples of unforeseen considerations. A mega-project can, by law, create a solid block, with no writing than can help to give access to light, and natural ventilation, not only for inhabitants but for the neighbouring buildings. The city is being built without hierarchy of space, without consideration to views and open space, without a properly defined urban shape. An eight story building requires around 3 years of labor to design and build. After being built, the building can stand for the next 30, 50, or 100 years. A compendium of rules can be developed in one year. Our city’s regulation should start taking into account the third generation.